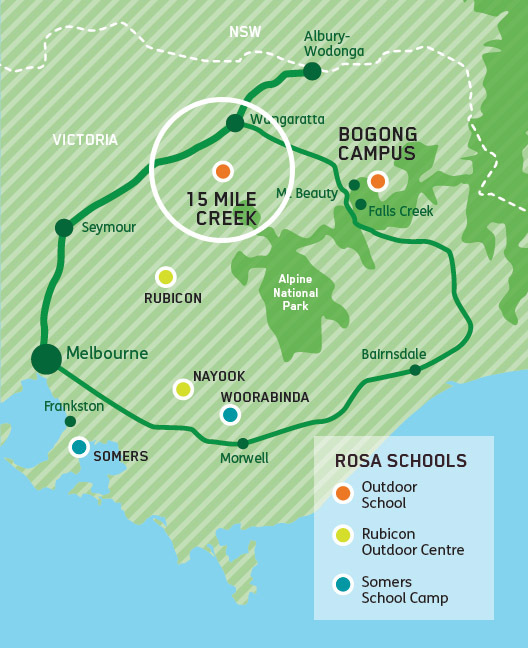 15 Mile Creek Campus is set in a picturesque natural bush setting in North East Victoria. Students are immersed in a rich and unique learning environment that allows them to explore, discover, be challenged and enjoy their learning. 15 Mile Creek offers a broad range of unique educational programs for students of all ages. Our curriculum is based around using the natural resources and unique environmental settings accessible in our local area, while still being linked strongly to the AusVELS framework. Primary, Secondary and VCE students undertaking Units 1-4 Outdoor & Environmental Studies all benefit from undertaking the programs that 15 Mile Creek has to offer. Programs are offered to our students under the guidance of our teaching staff, and specific programs are designed by us for each group that visits our school. A wide range of learning activities form the basis of the programs at 15 Mile Creek. These may include adventure, challenge, nature and interpretive based activities. 15 Mile Creek Campus is nestled in a scenic rural valley in the foothills of the Great Dividing Range. The campus is comprised of 110 hectares of unspoilt bush and adjoins state forest and farming land. 15 Mile Creek is located at Greta South in the Myrrhee Valley 220kms North East of Melbourne, 32km east of Benalla and 42km south of Wangaratta. Applications for 2019 have now closed. Please contact the school on 03 5766 6247 for further information.